Why pipeline management? Whether you think you are going to reach your goals or miss your goals, how do you know? Can you identify the path that will, or won’t, lead you to success? To do build and maintain the right pipeline, we have to change. Change the way we prospect, the amount of time we prospect, the way we qualify, present, negotiate and close. One thing is for sure, your sales come from your pipeline. And your current pipeline represents the way you sell. To make your pipeline look better, you will have to change something: your sales tactics, strategies and/or sales habits. Your pipeline will guide you to know how much and how often you need to change. First, let’s talk about what pipeline management is not. Adding opportunities to your pipeline, where all of your “sales projects” can be found, is Project Management, not pipeline management. If your pipeline is more of an endless pit than it is a path to success, than you have an “un-managed” pipeline…but, you do have a very big digital filing system to put all of your notes. That kind of filing system is great for project management… someday, you’ll be able to review the entire history of every sales project you ever began. But it’s not pipeline management. Pipeline management begins by creating a clear and unambiguous dashboard that showcases your “best” opportunities, the ones which, using objective criteria, define your path to your goal. With the right dashboard, in a glance, you know if you are going to make the budget or not. Like a GPS, your pipeline should guide your decisions about the ever-changing pool of “deals” you are actively working on in any given day. Pipeline management is maintained once you can trust the information in your pipeline. Then, you will more effectively manage your time, inspect your portfolio of prospects and reconsider your sales tactics and strategies in order to achieve the ideal pipeline. With your properly managed pipeline as a guide, you will correctly manage yourself every day; and sell more effectively because you will always be operating from a position of strength. What you are looking at in the image below is not exactly the view you would see when looking at your own pipeline. It is actually an easier view to look at because it isolates how many open opportunities “are collecting” at each stage, the opportunities the salesperson is “counting on.” We will use this simplistic view for demonstration purposes. Each X represents another opportunity, which may or may not be separate sales opportunities within the same account. Look at the column headings, A, B, C, & D, which I am using to represent typical pipeline positions; a complex amount of data simplified for our purposes. Consider how vague the language is which translates A through D. But also consider your own pipeline with your “%” headings…are they really less vague? How many salespeople and managers share the exact same definitions? How many exceptions to those definitions can be found in each column? Taking a first glance at this pipeline it looks like the seller is doing great because they have so much stuff going on, but don’t be misled by the number of pages or the number of Xs on each page. While this may look right in theory, it’s unrealistic in practice. 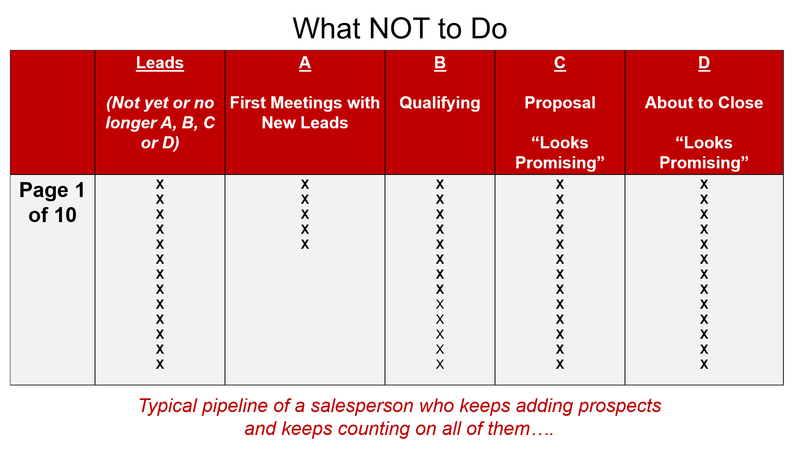 No salesperson could actively and simultaneously sell to each of these prospects. How would you manage a portfolio this size? There’s too many to look at in a single view. Too many to keep track of every day. And too many of those will likely not close within our normal sales cycle. What’s wrong with this message? It misleads you into thinking you don’t need to continue prospecting for new opportunities. It’s a false sense of security tricking you into believing you already have enough in each column to cover both your long-term and short-term sales needs. How does this pipeline compare to yours? Properly managed, your pipeline is your sales dashboard. At a glance, you want to be able to determine where you stand and what you need to do next. When you look at your pipeline in the middle of a busy day, you should be able to draw a conclusion and make a decision. When you look at all of the many prospects you have in your pipeline, you should see a clear, “low-risk” path to your goal. 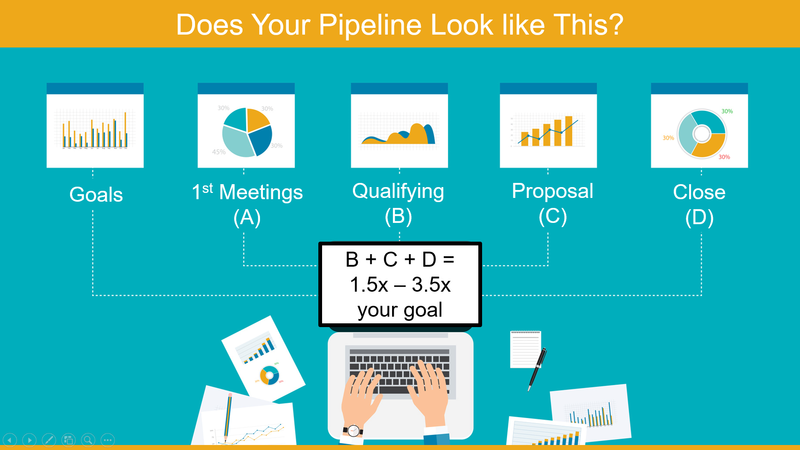 Does your pipeline work this way? For instance, if you had this image in your head as you began talking with a new lead, you would surely handle that meeting differently. If you had to choose between prospecting and writing a proposal, you would instantly know what activity to focus on by looking at the dashboard. This pipeline only showcases the very best prospects. All of which are following the pattern the majority of your closes follow, including the “usual” amount of time at each stage. Our observations indicate that if you want to accurately forecast AND prevent the typical monthly or quarterly ups and downs, the optimal total value of your pipeline should be 1.5x – 3.5x your goal. Using this approach, your revenue target can be your starting point. Work from there to manage which of your opportunities qualifies for this special pipeline. The stricter you are with admittance to the pipeline, the fewer opportunities you need in your path to get to your goal. Manageable number of prospects in the path to the goal – you can concentrate on a few and increase your closing ratio. 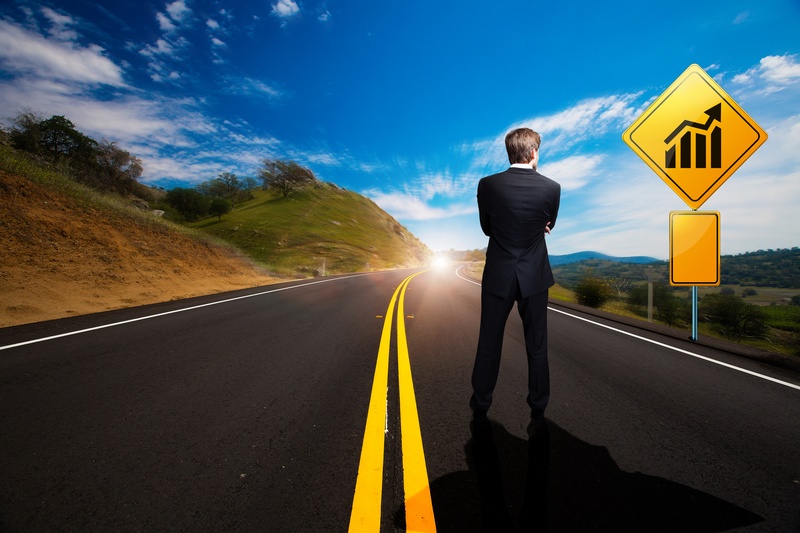 Short-Term Success: Enough prospects at “D” to always have enough deals closing – focusing on the sales cycle and decision timing means your eye is always on the close date. 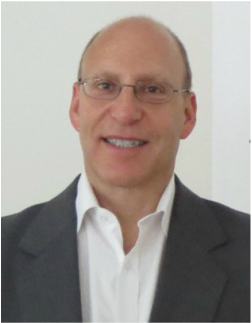 Long-Term Success: Enough prospects at “A” and “B” to back-fill “C” and “D” – once your short term sales needs are met you have the luxury of blending in long-term relationship building and personal marketing strategies into every week. We’re clear what each column means, how it contributes to success, what to do next – and, once everyone is on the same page, we can all share best practices, replicate winning strategies and optimize weaknesses. 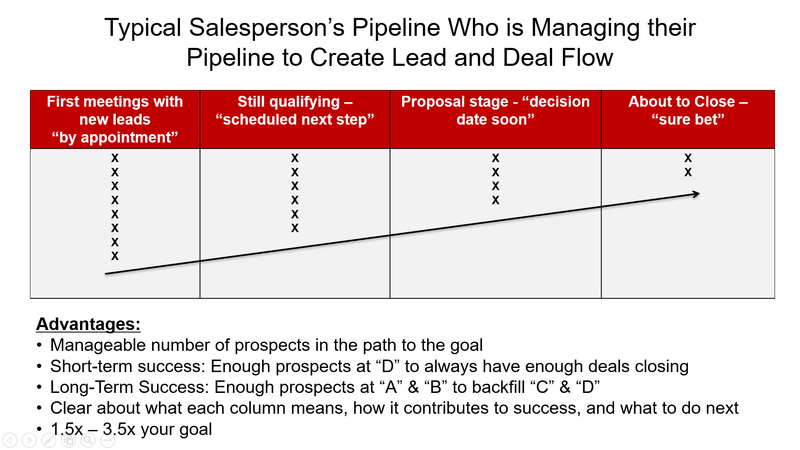 The managed pipeline is a tool to help the determined salesperson make more sales by guiding them to maximize their time with prospects more likely to buy and decrease time spent on the others. This is just the tip of the iceberg when it comes to Pipeline Management, if you want to continue drilling down to learn more, check out our Pipeline Management Made Easy Guide here.